Could Windows Live Photo Gallery be the world's free Photoshop? Everyone carries digital cameras, but not everyone's discovered the importance of editing and managing the hundreds of pictures they can hold. That's where Live Photo Gallery comes in, giving you a one-stop shop for managing, editing and uploading. It lets you do some very impressive tricks indeed, especially for a free download. Many of the Wave 4 features are familiar from the earlier Essentials releases (and from the original Vista Windows Gallery), with the new version gaining a new look and feel thanks to the Windows 7 iteration of Microsoft's ribbon user interface. Every section has seen a massive improvement, however, starting with management. Managing images is all about search, and while images aren't the easiest of things to index, Microsoft has made it a lot easier to add captions and tags to them. One option lets you quickly geo-tag pictures, typing the place name to add where you took the picture to the image metadata (although sadly not in a way that's supported by popular photo-sharing site Flickr). 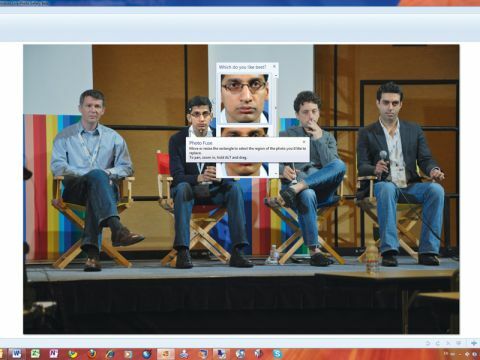 There's a big improvement to the way Live Photo Gallery tags people too, with a new face-detection tool. The image-editing features are the most exciting part of the app. To start with, most of the basic editing features are available in the gallery itself. You can auto-correct, tweak colours and exposure and apply basic image effects without opening images, something that speeds up basic image processing workflow. Once you open an image and move to the Edit tab, you'll find more image-processing tools, including red eye removal and a Retouch tool that helps to remove blemishes. Unlike other retouch tools, this isn't a healing brush and so it doesn't need you to create an accurate outline around what you want to remove. All you need to do is drag a rectangle around the area you want to change, and let Live Photo Gallery do the rest. Photo Fuse is another of the brand-new features in this version. If you've taken several photos of a group of people only to find that someone's blinking in each one, you can use this to collect all the open eyes and bring them into one final version. Select the images and Live Photo Gallery will align them, giving you one base image to work with. Once you've selected the area to edit (typically a head) you'll be shown the alternative content from the other images. You can then drop the section of image you want into place. Photo Fuse capably blends the images, leaving you with the photo you wanted to take in the first place. It's a surprisingly useful tool and one that gives you effective results for very little effort. One feature of Live Photo Gallery that often gets overlooked is its ability to launch other image editing tools, like Photosynth and Microsoft Research's advanced image stitching and collage tools. Use the 'More Tools' option in the Create tab to download plug-ins, launch installed applications and open the currently selected images in any other image-editing tools you might have installed on your PC. Microsoft has also added new upload plug-ins, with support for sharing images on Facebook and videos on YouTube, as well as storing files on its own Windows Live SkyDrive service. The upload tools have had a makeover, so it's now easier to add tags and deliver images to the right online groups and galleries. Despite its powerful new image editing tools, Live Photo Gallery isn't a replacement for high-end software like Adobe's Lightroom and Photoshop. What it is, however, is a replacement for budget image cataloguing and-editing tools like Photoshop Elements and Corel's Paint Shop Photo Express. It does the basics well, and at that most compelling of price points: free.